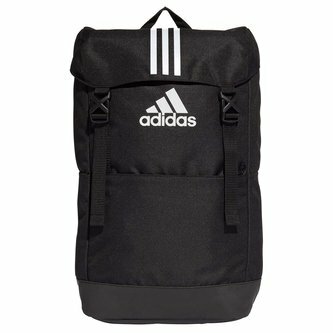 If you need a spacious bag that doesn't look like you're carrying a suitcase then look no further than the adidas 3 Stripes backpack in Black, Black and White. Never forget any equipment again or don't leave stuff out because you have no room when you're off to the gym with this roomy training backpack. It comes made of durable polyester and has plenty of pockets for organising essentials. This bag has an external sleeve for your laptop so that it doesn't need to get dirty in amongst your training kit. The adjustable padded shoulder straps allow for comfortable carrying from the first to the last mile.